Montessori School of Chambersburg was founded in 1988 based on the teachings and philosophy of Maria Montessori. The school offered unique educational and developmental experiences for preschool children unlike anything else found in Franklin County and quickly grew to include children from 18 months through kindergarten. In 1998 the Board of Directors obtained licensing from the Pennsylvania Department of Education and the Pennsylvania Department of Welfare as a non-profit corporation as well as becoming a full affiliate of The American Montessori Society. 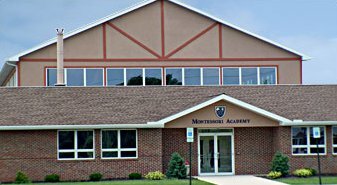 The Board then recruited certified teachers, administrators and faculty, and opened the doors for enrollment to Montessori Academy of Chambersburg. The following year, the school expanded to include an elementary program for 1st through 6th grade and later to include 7th and 8th grade. Thanks to the addition of a full-day kindergarten program in 2004, the Academy offered a comprehensive Montessori education for students in kindergarten through 8th grade. Prompted by increasing enrollment and the addition of new programs, stakeholders identified the need for a new facility specifically tailored to the growing needs of the students. The architectural design features several pods, each housing multi-age classrooms.